The photo links to the podcast in iTunes. 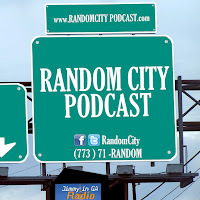 In the 86th episode of the podcast, I discuss the tenth anniversary of the The Random City Podcast. I get a new tagline for the podcast, but my main topic is how things have changed the last ten years. Much of this discussion centers around how Star Wars is like WWE. The episode is available now, in Spotify, Google Play, iTunes, Stitcher, the Satchel Player, and YouTube. I would greatly appreciate your ratings and reviews, on any of those platforms. Follow the show on Twitter at @randomcity and on Instagram at @RandomCityPodcast. Want to listen to TWO audio books, for free? If you're new to Audible, you can sign-up for a free trial of Audible, at http://audible.randomcitypodcast.com, to get TWO FREE audio books! The two free audio books are yours to keep, even if you cancel your membership during or after your free trail of the service. They have thousand of books to chose from. Recently, I have been enjoying the a couple of books by Scott Meyer. I'm about halfway through "Spell of High Water." This will probably be a topic on a future episode of the Random City Podcast. So, if you listen, it will be like a Random City Podcast Book Club, and that could be a lot of fun.